These highlights do not include all the information needed to use CIPRO safely and effectively. See full prescribing information for CIPRO. To report SUSPECTED ADVERSE REACTIONS, contact Bayer HealthCare Pharmaceuticals Inc. at 1-888-842-2937 or FDA at 1-800-FDA-1088 or www.fda.gov/medwatch. CIPRO is indicated in adult patients for treatment of skin and skin structure infectionscaused by Escherichia coli, Klebsiella pneumoniae, Enterobacter cloacae, Proteus mirabilis, Proteus vulgaris, Providencia stuartii, Morganella morganii, Citrobacter freundii, Pseudomonas aeruginosa, methicillin-susceptible Staphylococcus aureus, methicillin-susceptible Staphylococcus epidermidis, or Streptococcus pyogenes. CIPRO is indicated in adult patients for treatment of bone and joint infectionscaused by Enterobacter cloacae, Serratia marcescens, or Pseudomonas aeruginosa. CIPRO is indicated in adult patients for treatment of complicated intra-abdominal infections(used in combination with metronidazole) caused by Escherichia coli, Pseudomonas aeruginosa, Proteus mirabilis, Klebsiella pneumoniae, or Bacteroides fragilis. CIPRO is indicated in adult patients for treatment of infectious diarrheacaused by Escherichia coli (enterotoxigenic isolates), Campylobacter jejuni, Shigella boydii †, Shigella dysenteriae, Shigella flexneri or Shigella sonnei†when antibacterial therapy is indicated. CIPRO is indicated in adult patients for treatment of typhoid fever (enteric fever) caused by Salmonella typhi. The efficacy of ciprofloxacin in the eradication of the chronic typhoid carrier state has not been demonstrated. CIPRO is indicated in adult patients for treatment of uncomplicated cervical and urethral gonorrhea due to Neisseria gonorrhoeae [see Warnings and Precautions (5.16)]. CIPRO is indicated in adults and pediatric patients from birth to 17 years of age for inhalational anthrax (post-exposure) to reduce the incidence or progression of disease following exposure to aerosolized Bacillus anthracis. CIPRO is indicated for treatment of plague, including pneumonic and septicemic plague, due to Yersinia pestis (Y. pestis) and prophylaxis for plague in adults and pediatric patients from birth to 17 years of age. Efficacy studies of ciprofloxacin could not be conducted in humans with plague for feasibility reasons. Therefore this indication is based on an efficacy study conducted in animals only [see Clinical Studies (14.3)]. CIPRO is indicated in adult patients for treatment of chronic bacterial prostatitiscaused by Escherichia coli or Proteus mirabilis. CIPRO is indicated in adult patients for treatment of lower respiratory tract infectionscaused by Escherichia coli, Klebsiella pneumoniae, Enterobacter cloacae, Proteus mirabilis, Pseudomonas aeruginosa, Haemophilus influenzae, Haemophilus parainfluenzae, or Streptococcus pneumoniae. CIPRO is not a drug of first choice in the treatment of presumed or confirmed pneumonia secondary to Streptococcus pneumoniae. CIPRO is indicated for the treatment of acute exacerbations of chronic bronchitis (AECB) caused by Moraxella catarrhalis. Because fluoroquinolones, including CIPRO, have been associated with serious adverse reactions [see Warnings and Precautions (5.1–5.15)] and for some patients AECB is self-limiting, reserve CIPRO for treatment of AECB in patients who have no alternative treatment options. CIPRO is indicated in adult patients for treatment of urinary tract infectionscaused by Escherichia coli, Klebsiella pneumoniae, Enterobacter cloacae, Serratia marcescens, Proteus mirabilis, Providencia rettgeri, Morganella morganii, Citrobacter koseri, Citrobacter freundii, Pseudomonas aeruginosa, methicillin-susceptible Staphylococcus epidermidis, Staphylococcus saprophyticus, or Enterococcus faecalis. CIPRO is indicated in adult female patients for treatment of acute uncomplicated cystitis caused by Escherichia coli or Staphylococcus saprophyticus. Because fluoroquinolones, including CIPRO, have been associated with serious adverse reactions [see Warnings and Precautions (5.1-5.15)] and for some patients acute uncomplicated cystitis is self-limiting, reserve CIPRO for treatment of acute uncomplicated cystitis in patients who have no alternative treatment options. CIPRO is indicated in pediatric patients aged one to 17 years of age for treatment of complicated urinary tract infections (cUTI) and pyelonephritis due to Escherichia coli [see Use in Specific Populations (8.4)]. Although effective in clinical trials, CIPRO is not a drug of first choice in the pediatric population due to an increased incidence of adverse reactions compared to controls, including reactions related to joints and/or surrounding tissues. CIPRO, like other fluoroquinolones, is associated with arthropathy and histopathological changes in weight-bearing joints of juvenile animals [see Warnings and Precautions (5.12), Adverse Reactions (6.1), Use in Specific Populations (8.4) and Nonclinical Toxicology (13.2)]. CIPRO is indicated in adult patients for treatment of acute sinusitiscaused by Haemophilus influenzae,Streptococcus pneumoniae, or Moraxella catarrhalis. Because fluoroquinolones, including CIPRO, have been associated with serious adverse reactions [see Warnings and Precautions (5.1-5.15)] and for some patients acute sinusitis is self-limiting, reserve CIPRO for treatment of acute sinusitis in patients who have no alternative treatment options. To reduce the development of drug-resistant bacteria and maintain the effectiveness of CIPRO and other antibacterial drugs, CIPRO should be used only to treat or prevent infections that are proven or strongly suspected to be caused by susceptible bacteria. When culture and susceptibility information are available, they should be considered in selecting or modifying antibacterial therapy. In the absence of such data, local epidemiology and susceptibility patterns may contribute to the empiric selection of therapy. If anaerobic organisms are suspected of contributing to the infection, appropriate therapy should be administered. Appropriate culture and susceptibility tests should be performed before treatment in order to isolate and identify organisms causing infection and to determine their susceptibility to ciprofloxacin. Therapy with CIPRO may be initiated before results of these tests are known; once results become available appropriate therapy should be continued. CIPRO Tablets and Oral Suspension should be administered orally as described in the appropriate Dosage Guidelines tables. The determination of dosage and duration for any particular patient must take into consideration the severity and nature of the infection, the susceptibility of the causative microorganism, the integrity of the patient’s host-defense mechanisms, and the status of renal and hepatic function. CIPRO Tablets or Oral Suspension may be administered to adult patients when clinically indicated at the discretion of the physician. Administer CIPRO for Oral Suspension using the co-packaged graduated spoon [see Dosage and Administration (2.7)]. Patients whose therapy is started with CIPRO IV may be switched to CIPRO Tablets or Oral Suspension when clinically indicated at the discretion of the physician (Table 2) [see Clinical Pharmacology (12.3)]. Dosing and initial route of therapy (that is, IV or oral) for cUTI or pyelonephritis should be determined by the severity of the infection. CIPRO should be administered as described in Table 3. Administer CIPRO for Oral Suspension using the co-packaged graduated spoon [see Dosage and Administration (2.7)]. Administer CIPRO at least 2 hours before or 6 hours after magnesium/aluminum antacids; polymeric phosphate binders (for example, sevelamer, lanthanum carbonate) or sucralfate; Videx® (didanosine) chewable/buffered tablets or pediatric powder for oral solution; other highly buffered drugs; or other products containing calcium, iron or zinc. Concomitant administration of CIPRO with dairy products (like milk or yogurt) or calcium-fortified juices alone should be avoided since decreased absorption is possible; however, CIPRO may be taken with a meal that contains these products. Assure adequate hydration of patients receiving CIPRO to prevent the formation of highly concentrated urine. Crystalluria has been reported with quinolones. Instruct the patient of the appropriate CIPRO administration [see Patient Counseling Information (17)]. CIPRO Oral Suspension is supplied in 5% (5 g ciprofloxacin in 100 mL) and 10% (10 g ciprofloxacin in 100 mL) strengths. 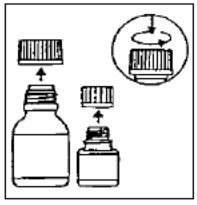 CIPRO oral suspension is composed of two components (microcapsules and diluent) that must be combined prior to dispensing. 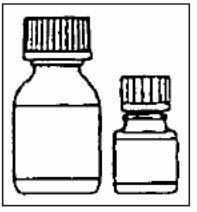 The small bottle contains the microcapsules, the large bottle contains the diluent. Pour the microcapsules completely into the larger bottle of diluent. Do not add water to the suspension. 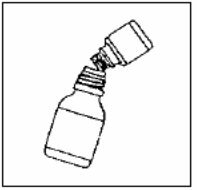 Remove the top layer of the diluent bottle label (to reveal the CIPRO Oral Suspension label). Close the large bottle completely according to the directions on the cap and shake vigorously for about 15 seconds. The suspension is ready for use. Step 5: Write the expiration date of the re-constituted oral suspension on the bottle label. No additions should be made to the mixed final ciprofloxacin suspension. 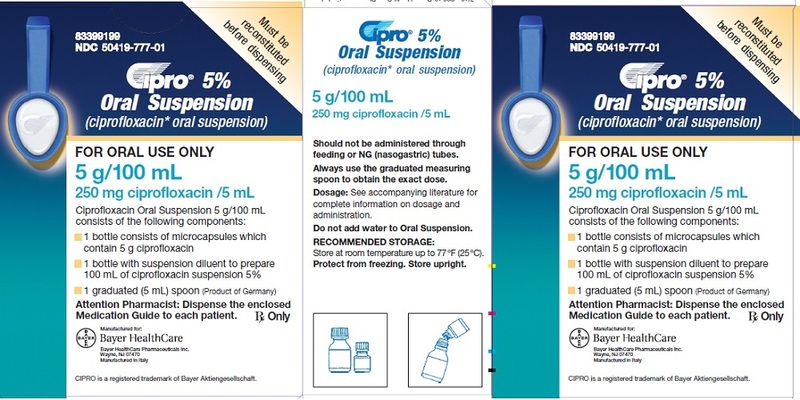 CIPRO Oral Suspension should not be administered through feeding or NG (nasogastric) tubes due to its physical characteristics. Shake CIPRO Oral Suspension vigorously each time before use for approximately 15 seconds. After use, clean the graduated teaspoon under running water with dish detergent and dry thoroughly. Do Not chew the microcapsules in the CIPRO Oral Suspension, instead swallow them whole. Water may be taken afterwards. After treatment has been completed, CIPRO Oral Suspension should not be reused. * A graduated teaspoon (5mL) with markings 1/2 (2.5) mL and 1/1 (5 mL) is provided for the patient. 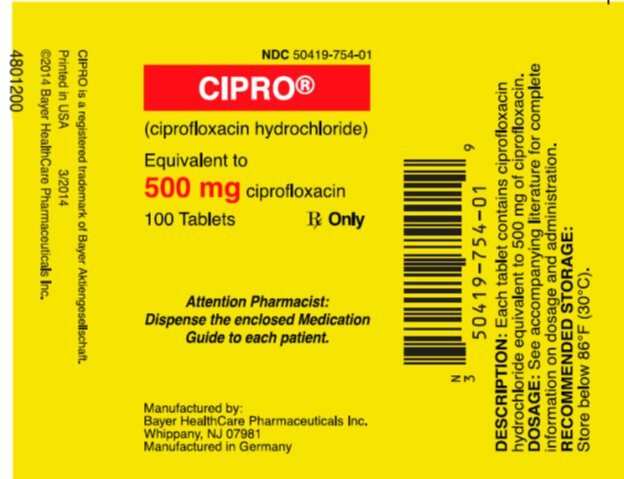 CIPRO is contraindicated in persons with a history of hypersensitivity to ciprofloxacin, any member of the quinolone class of antibacterials, or any of the product components [see Warnings and Precautions (5.7)]. Fluoroquinolones, including CIPRO, have been associated with disabling and potentially irreversible serious adverse reactions from different body systems that can occur together in the same patient. Commonly seen adverse reactions include tendinitis, tendon rupture, arthralgia, myalgia, peripheral neuropathy, and central nervous system effects (hallucinations, anxiety, depression, insomnia, severe headaches, and confusion).These reactions can occur within hours to weeks after starting CIPRO. Patients of any age or without pre-existing risk factors have experienced these adverse reactions [see Warnings and Precautions (5.2, 5.3, 5.4)]. Discontinue CIPRO immediately at the first signs or symptoms of any serious adverse reaction. In addition, avoid the use of fluoroquinolones, including CIPRO, in patients who have experienced any of these serious adverse reactions associated with fluoroquinolones. Fluoroquinolones, including CIPRO, have been associated with an increased risk of tendinitis and tendon rupture in all ages [see Warnings and Precautions (5.1) and Adverse Reactions (6.2)]. This adverse reaction most frequently involves the Achilles tendon, and has also been reported with the rotator cuff (the shoulder), the hand, the biceps, the thumb, and other tendons. Tendinitis or tendon rupture can occur, within hours or days of starting CIPRO, or as long as several months after completion of fluoroquinolone therapy.. Tendinitis and tendon rupture can occur bilaterally. The risk of developing fluoroquinolone-associated tendinitis and tendon rupture is increased in patients over 60 years of age, in patients taking corticosteroid drugs, and in patients with kidney, heart or lung transplants. Other factors that may independently increase the risk of tendon rupture include strenuous physical activity, renal failure, and previous tendon disorders such as rheumatoid arthritis. Tendinitis and tendon rupture have also occurred in patients taking fluoroquinolones who do not have the above risk factors. Discontinue CIPRO immediately if the patient experiences pain, swelling, inflammation or rupture of a tendon. Avoid fluoroquinolones, including CIPRO, in patients who have a history of tendon disorders or have experienced tendinitis or tendon rupture [see Adverse Reactions (6.2)]. Fluoroquinolones, including CIPRO, have been associated with an increased risk of peripheral neuropathy. Cases of sensory or sensorimotor axonal polyneuropathy affecting small and/or large axons resulting in paresthesias, hypoesthesias, dysesthesias and weakness have been reported in patients receiving fluoroquinolones, including CIPRO. Symptoms may occur soon after initiation of CIPRO and may be irreversible in some patients [see Warnings and Precautions (5.1) and Adverse Reactions (6.1, 6.2)]. Discontinue CIPRO immediately if the patient experiences symptoms of peripheral neuropathy including pain, burning, tingling, numbness, and/or weakness, or other alterations in sensations including light touch, pain, temperature, position sense and vibratory sensation, and/or motor strength in order to minimize the development of an irreversible condition. Avoid fluoroquinolones, including CIPRO, in patients who have previously experienced peripheral neuropathy [see Adverse Reactions (6.1, 6.2)]. Fluoroquinolones, including CIPRO, have been associated with an increased risk of psychiatric adverse reactions, including: toxic psychosis, psychotic reactions progressing to suicidal ideations/thoughts, hallucinations, or paranoia; depression, or self-injurious behavior such as attempted or completed suicide; anxiety, agitation, or nervousness; confusion, delirium, disorientation, or disturbances in attention; insomnia or nightmares; memory impairment. These reactions may occur following the first dose. Advise patients receiving CIPRO to inform their healthcare provider immediately if these reactions occur, discontinue the drug, and institute appropriate care. Fluoroquinolones, including CIPRO, have neuromuscular blocking activity and may exacerbate muscle weakness in patients with myasthenia gravis. Postmarketing serious adverse reactions, including deaths and requirement for ventilatory support, have been associated with fluoroquinolone use in patients with myasthenia gravis. Avoid CIPRO in patients with known history of myasthenia gravis [see Adverse Reactions (6.2)]. Discontinue CIPRO immediately at the first appearance of a skin rash, jaundice, or any other sign of hypersensitivity and supportive measures instituted [see Adverse Reactions (6.1, 6.2)]. Serious and occasionally fatal hypersensitivity (anaphylactic) reactions, some following the first dose, have been reported in patients receiving fluoroquinolone therapy, including CIPRO. Some reactions were accompanied by cardiovascular collapse, loss of consciousness, tingling, pharyngeal or facial edema, dyspnea, urticaria, and itching. Only a few patients had a history of hypersensitivity reactions. Serious anaphylactic reactions require immediate emergency treatment with epinephrine and other resuscitation measures, including oxygen, intravenous fluids, intravenous antihistamines, corticosteroids, pressor amines, and airway management, including intubation, as indicated [see Adverse Reactions (6.1)]. Cases of severe hepatotoxicity, including hepatic necrosis, life-threatening hepatic failure, and fatal events, have been reported with CIPRO. Acute liver injury is rapid in onset (range 1–39 days), and is often associated with hypersensitivity. The pattern of injury can be hepatocellular, cholestatic, or mixed. Most patients with fatal outcomes were older than 55 years old. In the event of any signs and symptoms of hepatitis (such as anorexia, jaundice, dark urine, pruritus, or tender abdomen), discontinue treatment immediately. There can be a temporary increase in transaminases, alkaline phosphatase, or cholestatic jaundice, especially in patients with previous liver damage, who are treated with CIPRO [see Adverse Reactions (6.2, 6.3)]. Serious and fatal reactions have been reported in patients receiving concurrent administration of CIPRO and theophylline. These reactions have included cardiac arrest, seizure, status epilepticus, and respiratory failure. Instances of nausea, vomiting, tremor, irritability, or palpitation have also occurred. Although similar serious adverse reactions have been reported in patients receiving theophylline alone, the possibility that these reactions may be potentiated by CIPRO cannot be eliminated. If concomitant use cannot be avoided, monitor serum levels of theophylline and adjust dosage as appropriate [see Drug Interactions (7)]. Clostridium difficile (C. difficile)-associated diarrhea (CDAD) has been reported with use of nearly all antibacterial agents, including CIPRO, and may range in severity from mild diarrhea to fatal colitis. Treatment with antibacterial agents alters the normal flora of the colon leading to overgrowth of C. difficile. Some fluoroquinolones, including CIPRO, have been associated with prolongation of the QT interval on the electrocardiogram and cases of arrhythmia. Cases of torsade de pointes have been reported during postmarketing surveillance in patients receiving fluoroquinolones, including CIPRO. Avoid CIPRO in patients with known prolongation of the QT interval, risk factors for QT prolongation or torsade de pointes (for example, congenital long QT syndrome, uncorrected electrolyte imbalance, such as hypokalemia or hypomagnesemia and cardiac disease, such as heart failure, myocardial infarction, or bradycardia), and patients receiving Class IA antiarrhythmic agents (quinidine, procainamide), or Class III antiarrhythmic agents (amiodarone, sotalol), tricyclic antidepressants, macrolides, and antipsychotics. Elderly patients may also be more susceptible to drug-associated effects on the QT interval [see Adverse Reactions (6.2), Use in Specific Populations (8.5)]. 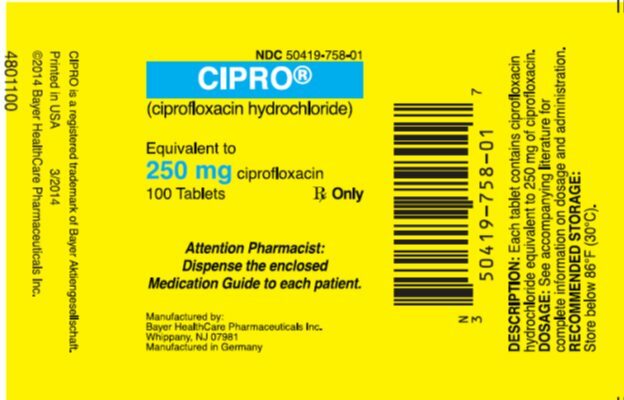 CIPRO is indicated in pediatric patients (less than 18 years of age) only for cUTI, prevention of inhalational anthrax (post exposure), and plague [see Indications and Usage (1.7, 1.8, 1.11)]. An increased incidence of adverse reactions compared to controls, including reactions related to joints and/or surrounding tissues, has been observed [see Adverse Reactions (6.1)]. In pre-clinical studies, oral administration of CIPRO caused lameness in immature dogs. Histopathological examination of the weight-bearing joints of these dogs revealed permanent lesions of the cartilage. Related quinolone-class drugs also produce erosions of cartilage of weight-bearing joints and other signs of arthropathy in immature animals of various species [see Use in Specific Populations (8.4) and Nonclinical Toxicology (13.2)]. Moderate to severe photosensitivity/phototoxicity reactions, the latter of which may manifest as exaggerated sunburn reactions (for example, burning, erythema, exudation, vesicles, blistering, edema) involving areas exposed to light (typically the face, “V” area of the neck, extensor surfaces of the forearms, dorsa of the hands), can be associated with the use of quinolones including CIPRO after sun or UV light exposure. Therefore, avoid excessive exposure to these sources of light. Discontinue CIPRO if phototoxicity occurs [see Adverse Reactions (6.1)]. Prescribing CIPRO Tablets and CIPRO Oral Suspension in the absence of a proven or strongly suspected bacterial infection or a prophylactic indication is unlikely to provide benefit to the patient and increases the risk of the development of drug-resistant bacteria. CIPRO is an inhibitor of the hepatic CYP1A2 enzyme pathway. Co-administration of CIPRO and other drugs primarily metabolized by CYP1A2 (for example, theophylline, methylxanthines, caffeine, tizanidine, ropinirole, clozapine, olanzapine and zolpidem) results in increased plasma concentrations of the co-administered drug and could lead to clinically significant pharmacodynamic adverse reactions of the co-administered drug [see Drug Interactions (7) and Clinical Pharmacology (12.3)]. CIPRO has not been shown to be effective in the treatment of syphilis. Antimicrobial agents used in high dose for short periods of time to treat gonorrhea may mask or delay the symptoms of incubating syphilis. Perform a serologic test for syphilis in all patients with gonorrhea at the time of diagnosis. Perform follow-up serologic test for syphilis three months after CIPRO treatment. Crystals of ciprofloxacin have been observed rarely in the urine of human subjects but more frequently in the urine of laboratory animals, which is usually alkaline [see Nonclinical Toxicology (13.2)]. Crystalluria related to CIPROhas been reported only rarely in humans because human urine is usually acidic. Avoid alkalinity of the urine in patients receiving CIPRO. Hydrate patients well to prevent the formation of highly concentrated urine [see Dosage and Administration (2.4)]. Fluoroquinolones, including CIPRO, have been associated with disturbances of blood glucose, including symptomatic hyperglycemia and hypoglycemia, usually in diabetic patients receiving concomitant treatment with an oral hypoglycemic agent (for example, glyburide) or with insulin. In these patients, careful monitoring of blood glucose is recommended. Severe cases of hypoglycemia resulting in coma or death have been reported. If a hypoglycemic reaction occurs in a patient being treated with CIPRO, discontinue CIPRO and initiate appropriate therapy immediately [see Adverse Reactions (6.1), Drug Interactions (7)]. During clinical investigations with oral and parenteral CIPRO, 49,038 patients received courses of the drug. In randomized, double-blind controlled clinical trials comparing CIPRO tablets [500 mg two times daily (BID)] to cefuroxime axetil (250 mg–500 mg BID) and to clarithromycin (500 mg BID) in patients with respiratory tract infections, CIPRO demonstrated a CNS adverse reaction profile comparable to the control drugs. The incidence rates of neurological adverse reactions within 6 weeks of treatment initiation were 3% (9/335) in the CIPRO group versus 2% (7/349) in the comparator group and included dizziness, nervousness, insomnia, and somnolence. Short-term safety data for ciprofloxacin was also collected in a randomized, double-blind clinical trial for the treatment of acute pulmonary exacerbations in cystic fibrosis patients (ages 5–17 years). Sixty seven patients received CIPRO IV 10 mg/kg/dose every 8 hours for one week followed by CIPRO tablets 20 mg/kg/dose every 12 hours to complete 10–21 days treatment and 62 patients received the combination of ceftazidime intravenous 50 mg/kg/dose every 8 hours and tobramycin intravenous 3 mg/kg/dose every8 hours for a total of 10–21 days. Periodic musculoskeletal assessments were conducted by treatment-blinded examiners. Patients were followed for an average of 23 days after completing treatment (range 0–93 days). Musculoskeletal adverse reactions were reported in 22% of the patients in the ciprofloxacin group and 21% in the comparison group. Decreased range of motion was reported in 12% of the subjects in the ciprofloxacin group and 16% in the comparison group. Arthralgia was reported in 10% of the patients in the ciprofloxacin group and 11% in the comparison group. Other adverse reactions were similar in nature and frequency between treatment arms. The efficacy of CIPRO for the treatment of acute pulmonary exacerbations in pediatric cystic fibrosis patients has not been established. The following adverse reactions have been reported from worldwide marketing experience with fluoroquinolones, including CIPRO. Because these reactions are reported voluntarily from a population of uncertain size, it is not always possible to reliably estimate their frequency or establish a causal relationship to drug exposure (Table 10). Ciprofloxacin is an inhibitor of human cytochrome P450 1A2 (CYP1A2) mediated metabolism. Co-administration of CIPRO with other drugs primarily metabolized by CYP1A2 results in increased plasma concentrations of these drugs and could lead to clinically significant adverse events of the co-administered drug. Concurrent administration of CIPRO with theophylline may result in increased risk of a patient developing central nervous system (CNS) or other adverse reactions. If concomitant use cannot be avoided, monitor serum levels of theophylline and adjust dosage as appropriate [see Warnings and Precautions (5.9)]. CIPRO may further prolong the QT interval in patients receiving drugs known to prolong the QT interval (for example, class IA or III antiarrhythmics, tricyclic antidepressants, macrolides, antipsychotics) [see Warnings and Precautions (5.11) and Use in Specific Populations (8.5)]. Hypoglycemia sometimes severe has been reported when CIPRO and oral antidiabetic agents, mainly sulfonylureas (for example, glyburide, glimepiride), were co-administered, presumably by intensifying the action of the oral antidiabetic agent. Fatalities have been reported. Monitor blood glucose when CIPRO is co-administered with oral antidiabetic drugs [see Adverse Reactions (6.1)]. To avoid the loss of seizure control associated with decreased phenytoin levels and to prevent phenytoin overdose-related adverse reactions upon CIPRO discontinuation in patients receiving both agents, monitor phenytoin therapy, including phenytoin serum concentration during and shortly after co-administration of CIPRO with phenytoin. Monitor renal function (in particular serum creatinine) when CIPRO is co-administered with cyclosporine. The risk may vary with the underlying infection, age and general status of the patient so that the contribution of CIPRO to the increase in INR (international normalized ratio) is difficult to assess. Monitor prothrombin time and INR frequently during and shortly after co-administration of CIPRO with an oral anti-coagulant (for example, warfarin). Potential increase in the risk of methotrexate associated toxic reactions. Therefore, carefully monitor patients under methotrexate therapy when concomitant CIPRO therapy is indicated. Monitoring for ropinirole-related adverse reactions and appropriate dose adjustment of ropinirole is recommended during and shortly after co-administration with CIPRO [see Warnings and Precautions (5.16)]. Careful monitoring of clozapine associated adverse reactions and appropriate adjustment of clozapine dosage during and shortly after co-administration with CIPRO are advised. CIPRO inhibits the formation of paraxanthine after caffeine administration (or pentoxifylline containing products). Monitor for xanthine toxicity and adjust dose as necessary. CIPRO should be taken at least two hours before or six hours after Multivalent cation-containing products administration [see Dosage and Administration (2.4)]. Potentiation of CIPRO toxicity may occur. Ciprofloxacin is excreted in human milk. The amount of ciprofloxacin absorbed by the nursing infant is unknown. Because of the potential risk of serious adverse reactions (including articular damage) in infants nursing from mothers taking CIPRO, a decision should be made whether to discontinue nursing or to discontinue the drug, taking into account the importance of the drug to the mother. Although effective in clinical trials, CIPRO is not a drug of first choice in the pediatric population due to an increased incidence of adverse reactions compared to controls. Quinolones, including CIPRO, cause arthropathy (arthralgia, arthritis), in juvenile animals [see Warnings and Precautions (5.12) and Nonclinical Toxicology (13.2)]. CIPRO is indicated for the treatment of cUTI and pyelonephritisdue to Escherichia coli in pediatric patients 1 to 17 years of age. Although effective in clinical trials, CIPRO is not a drug of first choice in the pediatric population due to an increased incidence of adverse reactions compared to the controls, including events related to joints and/or surrounding tissues [see Adverse Reactions (6.1) and Clinical Studies (14.1)]. CIPRO is indicated in pediatric patients from birth to 17 years of age, for inhalational anthrax (post-exposure). The risk-benefit assessment indicates that administration of ciprofloxacin to pediatric patients is appropriate [see Dosage and Administration (2.2) and Clinical Studies (14.2)]. CIPRO is indicated in pediatric patients from birth to 17 years of age, for treatment of plague, including pneumonic and septicemic plague due to Yersinia pestis (Y. pestis) and prophylaxis for plague. Efficacy studies of CIPRO could not be conducted in humans with pneumonic plague for feasibility reasons. Therefore, approval of this indication was based on an efficacy study conducted in animals. The risk-benefit assessment indicates that administration of CIPRO to pediatric patients is appropriate [see Indications and Usage (1.8), Dosage and Administration (2.2) and Clinical Studies (14.3)]. Geriatric patients are at increased risk for developing severe tendon disorders including tendon rupture when being treated with a fluoroquinolone such as CIPRO. This risk is further increased in patients receiving concomitant corticosteroid therapy. Tendinitis or tendon rupture can involve the Achilles, hand, shoulder, or other tendon sites and can occur during or after completion of therapy; cases occurring up to several months after fluoroquinolone treatment have been reported. Caution should be used when prescribing CIPRO to elderly patients especially those on corticosteroids. Patients should be informed of this potential adverse reaction and advised to discontinue CIPRO and contact their healthcare provider if any symptoms of tendinitis or tendon rupture occur. [see Boxed Warning, Warnings and Precautions (5.2), and Adverse Reactions (6.2)]. In a retrospective analysis of 23 multiple-dose controlled clinical trials of CIPRO encompassing over 3500 ciprofloxacin-treated patients, 25% of patients were greater than or equal to 65 years of age and 10% were greater than or equal to 75 years of age. No overall differences in safety or effectiveness were observed between these subjects and younger subjects, and other reported clinical experience has not identified differences in responses between the elderly and younger patients, but greater sensitivity of some older individuals on any drug therapy cannot be ruled out. Ciprofloxacin is known to be substantially excreted by the kidney, and the risk of adverse reactions may be greater in patients with impaired renal function. No alteration of dosage is necessary for patients greater than 65 years of age with normal renal function. However, since some older individuals experience reduced renal function by virtue of their advanced age, care should be taken in dose selection for elderly patients, and renal function monitoring may be useful in these patients [see Dosage and Administration (2.3) and Clinical Pharmacology (12.3)]. In general, elderly patients may be more susceptible to drug-associated effects on the QT interval. Therefore, precaution should be taken when using CIPRO with concomitant drugs that can result in prolongation of the QT interval (for example, class IA or class III antiarrhythmics) or in patients with risk factors for torsade de pointes (for example, known QT prolongation, uncorrected hypokalemia) [see Warnings and Precautions (5.11)]. CIPRO film-coated tablets are available in 250 mg and 500 mg (ciprofloxacin equivalent) strengths. CIPRO tablets are white to slightly yellowish. The inactive ingredients are cornstarch, microcrystalline cellulose, silicon dioxide, crospovidone, magnesium stearate, hypromellose, titanium dioxide, and polyethylene glycol. Microcapsules–ciprofloxacin, povidone, methacrylic acid copolymer, hypromellose, magnesium stearate, and Polysorbate 20. Diluent–medium-chain triglycerides, sucrose, soy-lecithin, water, and strawberry flavor. Five (5) mL of 5% suspension contains approximately 1.4 g of sucrose and 5 mL of 10% suspension contains approximately 1.3 g of sucrose. The absolute bioavailability of ciprofloxacin when given as an oral tablet is approximately 70% with no substantial loss by first pass metabolism. Ciprofloxacin maximum serum concentrations and area under the curve are shown in the chart for the 250 mg to 1000 mg dose range (Table 12). A 500 mg oral dose given every 12 hours has been shown to produce AUC equivalent to that produced by an intravenous infusion of 400 mg CIPRO given over 60 minutes every 12 hours. A 750 mg oral dose given every 12 hours has been shown to produce an AUC at steady-state equivalent to that produced by an intravenous infusion of 400 mg given over 60 minutes every 8 hours. A 750 mg oral dose results in a Cmax similar to that observed with a 400 mg intravenous dose. A 250 mg oral dose given every 12 hours produces an AUC equivalent to that produced by an infusion of 200 mg CIPRO given every 12 hours (Table 13). With oral administration, a 500 mg dose, given as 10 mL of the 5% CIPRO Suspension (containing 250 mg ciprofloxacin/5mL) is bioequivalent to the 500 mg tablet. A 10 mL volume of the 5% CIPRO Suspension (containing 250 mg ciprofloxacin/5mL) is bioequivalent to a 5 mL volume of the 10% CIPRO Suspension (containing 500 mg ciprofloxacin/5mL). Following a single oral dose of 10 mg/kg CIPRO suspension to 16 children ranging in age from 4 months to 7 years, the mean Cmax was 2.4 mcg/mL (range: 1.5 mcg/mL to 3.4 mcg/mL) and the mean AUC was 9.2 mcg*hr/mL (range: 5.8 mcg*hr/mL to 14.9 mcg*h/mL). There was no apparent age-dependence, and no notable increase in Cmax or AUC upon multiple dosing (10 mg/kg three times a day). In children with severe sepsis who were given CIPRO IV (10 mg/kg as a 1-hour intravenous infusion), the mean Cmax was 6.1 mcg/mL (range: 4.6 mcg/mL to 8.3 mcg/mL) in 10 children less than 1 year of age; and 7.2 mcg/mL (range: 4.7 mcg/mL to 11.8 mcg/mL) in 10 children between 1 year and 5 years of age. The AUC values were 17.4 mcg*hr/mL (range: 11.8 mcg*hr/mL to 32 mcg*hr/mL) and 16.5 mcg*hr/mL (range: 11 mcg*hr/mL to 23.8 mcg*hr/mL) in the respective age groups. These values are within the range reported for adults at therapeutic doses. Based on population pharmacokinetic analysis of pediatric patients with various infections, the predicted mean half-life in children is approximately 4 hours –5 hours, and the bioavailability of the oral suspension is approximately 60%. In a pharmacokinetic study, systemic exposure of tizanidine (4 mg single dose) was significantly increased (Cmax 7-fold, AUC 10-fold) when the drug was given concomitantly with CIPRO (500 mg twice a day for 3 days). Concomitant administration of tizanidine and CIPRO is contraindicated due to the potentiation of hypotensive and sedative effects of tizanidine [see Contraindications (4.2)]. In a study conducted in 12 patients with Parkinson’s disease who were administered 6 mg ropinirole once daily with 500 mg CIPRO twice-daily, the mean Cmax and mean AUC of ropinirole were increased by 60% and 84%, respectively. Monitoring for ropinirole-related adverse reactions and appropriate dose adjustment of ropinirole is recommended during and shortly after co-administration with CIPRO [see Warnings and Precautions (5.9)]. Following concomitant administration of 250 mg CIPRO with 304 mg clozapine for 7 days, serum concentrations of clozapine and N-desmethylclozapine were increased by 29% and 31%, respectively. Careful monitoring of clozapine associated adverse reactions and appropriate adjustment of clozapine dosage during and shortly after co-administration with CIPRO are advised. Following concomitant administration of a single oral dose of 50 mg sildenafil with 500 mg CIPRO to healthy subjects, the mean Cmax and mean AUC of sildenafil were both increased approximately two-fold. Use sildenafil with caution when co-administered with CIPRO due to the expected two-fold increase in the exposure of sildenafil upon co-administration of CIPRO. In a study conducted in 9 healthy volunteers, concomitant use of 1.5 mg/kg IV lidocaine with CIPRO 500 mg twice daily resulted in an increase of lidocaine Cmax and AUC by 12% and 26%, respectively. Although lidocaine treatment was well tolerated at this elevated exposure, a possible interaction with CIPRO and an increase in adverse reactions related to lidocaine may occur upon concomitant administration. When CIPRO was administered as a single 1000 mg dose concomitantly with omeprazole (40 mg once daily for three days) to 18 healthy volunteers, the mean AUC and Cmax of ciprofloxacin were reduced by 20% and 23%, respectively. The clinical significance of this interaction has not been determined. Long-term carcinogenicity studies in rats and mice resulted in no carcinogenic or tumorigenic effects due to CIPRO at daily oral dose levels up to 250 mg/kg and 750 mg/kg to rats and mice, respectively (approximately 1.7- and 2.5- times the highest recommended therapeutic dose based upon body surface area, respectively). In this model, mice treated with CIPRO alone did not develop skin or systemic tumors. There are no data from similar models using pigmented mice and/or fully haired mice. The clinical significance of these findings to humans is unknown. Fertility studies performed in rats at oral doses of CIPRO up to 100 mg/kg (approximately 0.7-times the highest recommended therapeutic dose based upon body surface area) revealed no evidence of impairment. Ciprofloxacin and other quinolones have been shown to cause arthropathy in immature animals of most species tested [see Warnings and Precautions (5.12)].Damage of weight bearing joints was observed in juvenile dogs and rats. In young beagles, 100 mg/kg ciprofloxacin, given daily for 4 weeks, caused degenerative articular changes of the knee joint. At 30 mg/kg, the effect on the joint was minimal. In a subsequent study in young beagle dogs, oral ciprofloxacin doses of 30 mg/kg and 90 mg/kg ciprofloxacin (approximately 1.3-times and 3.5-times the pediatric dose based upon comparative plasma AUCs) given daily for 2 weeks caused articular changes which were still observed by histopathology after a treatment-free period of 5 months. At 10 mg/kg (approximately 0.6-times the pediatric dose based upon comparative plasma AUCs), no effects on joints were observed. This dose was also not associated with arthrotoxicity after an additional treatment-free period of 5 months. In another study, removal of weight bearing from the joint reduced the lesions but did not totally prevent them. CIPRO administered intravenously and/or orally was compared to a cephalosporin for treatment of cUTI and pyelonephritis in pediatric patients 1 to 17 years of age (mean age of 6 ± 4 years). The trial was conducted in the US, Canada, Argentina, Peru, Costa Rica, Mexico, South Africa, and Germany. The duration of therapy was 10 to 21 days (mean duration of treatment was 11 days with a range of 1 to 88 days). The primary objective of the study was to assess musculoskeletal and neurological safety. The clinical success and bacteriologic eradication rates in the Per Protocol population were similar between CIPRO and the comparator group as shown below. More than 9300 persons were recommended to complete a minimum of 60 days of antibacterial prophylaxis against possible inhalational exposure to B. anthracis during 2001. CIPRO was recommended to most of those individuals for all or part of the prophylaxis regimen. Some persons were also given anthrax vaccine or were switched to alternative antibacterial drugs. No one who received CIPRO or other therapies as prophylactic treatment subsequently developed inhalational anthrax. The number of persons who received CIPRO as all or part of their post-exposure prophylaxis regimen is unknown. Clinical and Laboratory Standards Institute (CLSI). Methods for Dilution Antimicrobial Susceptibility Tests for Bacteria That Grow Aerobically; Approved Standard–Tenth Edition. CLSI Document M7-A10 . Clinical and Laboratory Standards Institute, 950 West Valley Rd., Suite 2500, Wayne, PA. 19087- 1898. Clinical and Laboratory Standards Institute (CLSI). Methods for Antimicrobial Dilution and Disk Susceptibility Testing of Infrequently Isolated or Fastidious Bacteria; Approved Guideline–Third Edition. CLSI Document M45-A3 . Clinical and Laboratory Standards Institute, 950 West Valley Rd., Suite 2500, Wayne, PA. 19087- 1898. Clinical and Laboratory Standards Institute (CLSI), Performance Standards for Antimicrobial Disk Susceptibility Tests; Approved Standard–Twelfth Edition. CLSI Document M2-A12 . Clinical and Laboratory Standards Institute, 950 West Valley Rd., Suite 2500, Wayne, PA. 19087- 1898. CIPRO (ciprofloxacin hydrochloride) Tablets are available as round, slightly yellowish film-coated tablets containing 250 mg ciprofloxacin. The 250 mg tablet is coded with the word “BAYER” on one side and “CIP 250” on the reverse side. CIPRO is also available as capsule shaped, slightly yellowish film-coated tablets containing 500 mg ciprofloxacin. The 500 mg tablet is coded with the word “BAYER” on one side and “CIP 500” on the reverse side. CIPRO 250 mg and 500 mg are available in bottles of 100. CIPRO Oral Suspension is supplied in 5% and 10% strengths. The drug product is composed of two components (microcapsules containing the active ingredient and diluent) which must be mixed by the pharmacist [see Dosage and Administration (2.5)]. Store microcapsules and diluent below 25°C (77°F); excursions are permitted from 15°C to 30°C (59°F to 86°F) [see USP Controlled Room Temperature]. Protect from freezing. The reconstituted product may be stored at 25°C (77°F) for 14 days; excursions are permitted from 15°C to 30°C (59°F to 86°F) [see USP Controlled Room Temperature]. Protect from freezing. A graduated teaspoon (5mL) with markings 1/2 (2.5 mL and 1/1 (5 mL) is provided for the patient. Advise patients to stop taking CIPRO if they experience an adverse reaction and to call their healthcare provider for advice on completing the full course of treatment with another antibacterial drug. Disabling and potentially irreversible serious adverse reactions that may occur together: Inform patients that disabling and potentially irreversible serious adverse reactions, including tendinitis and tendon rupture, peripheral neuropathies, and central nervous system effects, have been associated with use of CIPRO and may occur together in the same patient. Inform patients to stop taking CIPRO immediately if they experience an adverse reaction and to call their healthcare provider. Tendinitis and tendon rupture: Instruct patients to contact their healthcare provider if they experience pain, swelling, or inflammation of a tendon, or weakness or inability to use one of their joints; rest and refrain from exercise; and discontinue CIPRO treatment. Symptoms may be irreversible. The risk of severe tendon disorder with fluoroquinolones is higher in older patients usually over 60 years of age, in patients taking corticosteroid drugs, and in patients with kidney, heart or lung transplants. Peripheral Neuropathies: Inform patients that peripheral neuropathies have been associated with ciprofloxacin use, symptoms may occur soon after initiation of therapy and may be irreversible. If symptoms of peripheral neuropathy including pain, burning, tingling, numbness and/or weakness develop, immediately discontinue CIPRO and tell them to contact their physician. Central nervous system effects (for example, convulsions, dizziness, lightheadedness, increased intracranial pressure) : Inform patients that convulsions have been reported in patients receiving fluoroquinolones, including Ciprofloxacin. Instruct patients to notify their physician before taking this drug if they have a history of convulsions. Inform patients that they should know how they react to CIPRO before they operate an automobile or machinery or engage in other activities requiring mental alertness and coordination. Instruct patients to notify their physician if persistent headache with or without blurred vision occurs. Hypersensitivity Reactions: Inform patientsthat ciprofloxacin can cause hypersensitivity reactions, even following a single dose, and to discontinue the drug at the first sign of a skin rash, hives or other skin reactions, a rapid heartbeat, difficulty in swallowing or breathing, any swelling suggesting angioedema (for example, swelling of the lips, tongue, face, tightness of the throat, hoarseness), or other symptoms of an allergic reaction. Hepatotoxicity: Inform patients that severe hepatotoxicity (including acute hepatitis and fatal events) has been reported in patients taking CIPRO. Instruct patients to inform their physician if they experience any signs or symptoms of liver injury including: loss of appetite, nausea, vomiting, fever, weakness, tiredness, right upper quadrant tenderness, itching, yellowing of the skin and eyes, light colored bowel movements or dark colored urine. Tizanidine: Instruct patients not to use ciprofloxacin if they are already taking tizanidine. CIPRO increases the effects of tizanidine (Zanaflex ®). Theophylline: Inform patients that ciprofloxacin CIPRO may increase the effects of theophylline. Life-threatening CNS effects and arrhythmias can occur. Advise the patients to immediately seek medical help if they experience seizures, palpitations, or difficulty breathing. Caffeine: Inform patients that CIPRO may increase the effects of caffeine. There is a possibility of caffeine accumulation when products containing caffeine are consumed while taking quinolones. Inform patients that antibacterial drugs including CIPRO Tablets and CIPRO Oral Suspension should only be used to treat bacterial infections. They do not treat viral infections (for example, the common cold). When CIPRO Tablets and CIPRO Oral Suspension are prescribed to treat a bacterial infection, patients should be told that although it is common to feel better early in the course of therapy, the medication should be taken exactly as directed. Skipping doses or not completing the full course of therapy may (1) decrease the effectiveness of the immediate treatment and (2) increase the likelihood that bacteria will develop resistance and will not be treatable by CIPRO Tablets and CIPRO Oral Suspension or other antibacterial drugs in the future. To shake CIPRO Oral Suspension vigorously each time before use for approximately 15 seconds. To always use the co-packaged graduated measuring spoon with markings for 1/2 (2.5 mL) and 1/1 (5 mL), to obtain the exact dose. After use, the graduated measuring spoon should be cleaned under running water with dish detergent and dried thoroughly. Not to chew the microcapsules, but to swallow them whole. Inform patients that CIPRO may be taken with or without food. Inform patients to drink fluids liberally while taking CIPRO to avoid formation of highly concentrated urine and crystal formation in the urine. Inform patients that antacids containing magnesium, or aluminum, as well as sucralfate, metal cations such as iron, and multivitamin preparations with zinc or didanosine should be taken at least two hours before or six hours after CIPRO administration. CIPRO should not be taken with dairy products (like milk or yogurt) or calcium-fortified juices alone since absorption of ciprofloxacin may be significantly reduced; however, CIPRO may be taken with a meal that contains these products. Inform patients that hypoglycemia has been reported when ciprofloxacin and oral antidiabetic agents were co-administered; if low blood sugar occurs with CIPRO, instruct them to consult their physician and that their antibacterial medicine may need to be changed. Inform patients given CIPRO for these conditions that efficacy studies could not be conducted in humans for feasibility reasons. Therefore, approval for these conditions was based on efficacy studies conducted in animals. Stop taking CIPRO immediately and get medical help right away at the first sign of tendon pain, swelling or inflammation. The most common area of pain and swelling is the Achilles tendon at the back of your ankle. This can also happen with other tendons. CIPRO is also used in children younger than 18 years of age to treatcomplicated urinary tract and kidney infections or who may have breathed in anthrax germs, have plague or have been exposed to plague germs. Also take a medicine called tizanidine (Zanaflex ®). cyclosporine (Gengraf ®, Neoral ®, Sandimmune ®, Sangcya ®). Stop taking CIPRO and tell your healthcare provider right away if you have yellowing of your skin or white part of your eyes, or if you have dark urine. These can be signs of a serious reaction to CIPRO (a liver problem). Intestine infection(Pseudomembranous colitis). Pseudomembranous colitis can happen with many antibacterial medicines, including CIPRO. Call your healthcare provider right away if you get watery diarrhea, diarrhea that does not go away, or bloody stools. You may have stomach cramps and a fever. Pseudomembranous colitis can happen 2 or more months after you have finished your antibacterial medicine. Joint Problems. Increased chance of problems with joints and tissues around joints in children under 18 years old can happen. Tell your child’s healthcare provider if your child has any joint problems during or after treatment with CIPRO. People who take CIPRO and other fluoroquinolone medicines with oral anti-diabetes medicines or with insulin can get low blood sugar (hypoglycemia) and high blood sugar (hyperglycemia). Follow your healthcare provider's instructions for how often to check your blood sugar. If you have diabetes and you get low blood sugar while taking CIPRO, stop taking CIPRO and call your healthcare provider right away. Your antibiotic medicine may need to be changed. CIPRO is a registered trademark of Bayer Aktiengesellschaft. ©1987 Bayer HealthCare Pharmaceuticals Inc.